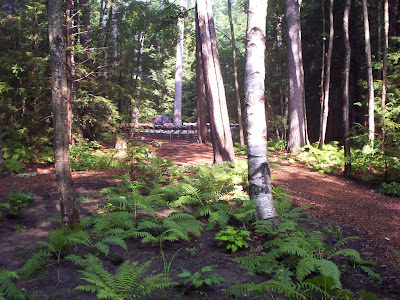 This photo is of the beautiful, outdoor chapel in the pines of 'The Grove'. Anyone who wants to sing can show up early and be part of the choir. The birds sing along as well, and the leaves rustle, and the tall pines sway. We'll also have a special memorial today after chapel for members of our group who passed away this year. Isn't that a pretty spot? Take care, and I won't be writing tomorrow till late in the day, if at all! Chat amongst yourselves in the comments. TTFN and have a nice Sunday! Day 1287 - Ahhhh - Saturday! No time for bloggage, I have a very busy day today, vacation or no! Having brown eyes, I have always been impressed that my children and granddaughter have BLUE eyes! Chat amongst yourselves and have a great Saturday! Day 1286 - What is Chowda, anyway? 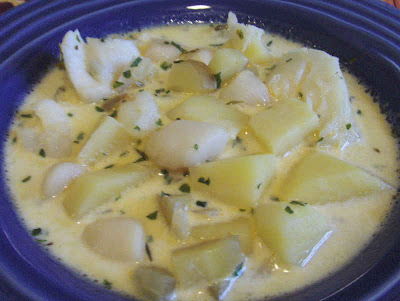 I am sure you know this, but 'real' chowder (from my perspective) begins with 'real' salt pork, slowly cooked down at the bottom of the pan so you have a little, highly salted oil to sautee the onions with. You extract the salt pork bits and set them aside to sprinkle on the chowder later, or not. They can be chewy. Some chowders don't have any onions, but I like onions. You then put in a few cups of water or fish stock if you had the bones and head to boil beforehand, and add your fish, and SLOWLY poach it, extracting all the flavor you possibly can without overcooking the fish. Meanwhile - I cook the potatoes separately in water and have them ready to go. They shouldn't fall apart, but they shouldn't be hard either. They should be fork tender. This looks like it has a sprinkle of chives on it, and I have also seen dill used that way. Day 1285 - V.A.C.A.T.I.O.N - in the summer sun! 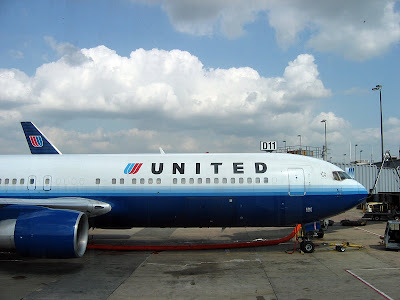 I am meeting Aunt Nancy in Chicago, and we are flying the rest of the way together to Portland, Maine. 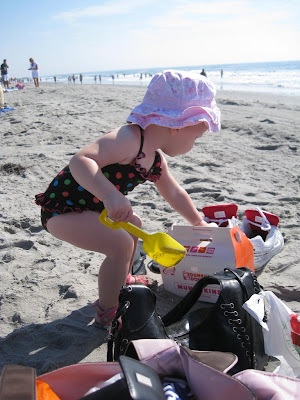 We'll kick off our vacation with some beach time, 'Chowda', more beach time, ice cream, and who knows what? Have a nice Thursday, and Thank you Charlie for getting up so early to take me to the airport! Day 1284 - Midweek, Midlife, and Vacation Eve!!! 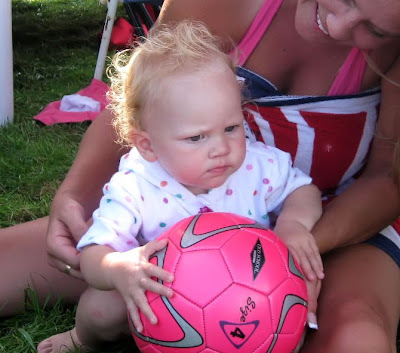 Here is Miss Savi, with that awesome pink soccer ball. I am getting ready to do my online checkin for my flight tomorrow morning, what fun! I've got my itinerary out, and my pocketbook handy, as they may want money to check in my bag. What a &^%$ the extra cost for baggage is! I am trying to pack 'lighter' this year and bring a smaller suitcase on my trip. Hopefully I can fit everything left to fit into it and still stay within the weight limit. I wonder if the airlines will start charging us based on what WE weigh? Anyway - gotta go! I have a very busy day today trying to wrap things up before my trip. TTFN and have a nice Wednesday! The Twofer of the day is for two little words... 'Bye-Bye'. A momentous event has occurred! 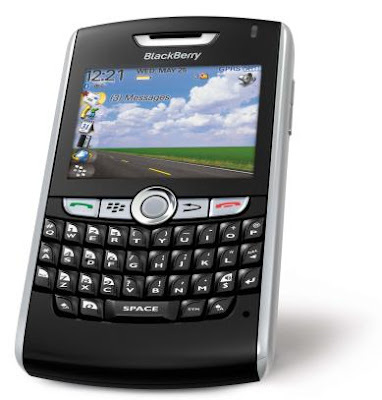 I handed off my blackberry yesterday to the person who will take over monitoring jobs. No more 'beeps' on Saturday evenings. No more early morning work sessions. No more middle of the night text conversations. No more Sundays spent at the computer. You wouldn't believe what a habit it becomes to have it nearby at all times... Charlie calls it a 'huckleberry', and won't miss it a bit! Not that I will MISS it except for maybe the calendar reminding me of meetings, and an alternate source of the internet when I need one! That's my news of the day - I'm going to leave early for work so I can TRY to catch up before my vacation! This picture looks like 'Savi gets a beer belly on the weekend'. Hilarious! I'd never heard that before, and he'd never heard the song version before! When he comes to her work, he doesn't butter his rolls and eat the rolls, he just eats the butter... She said that embarrasses her! Happy Belated Anniversary to Heather and Mike! Sorry we're not keeping up with that date better! 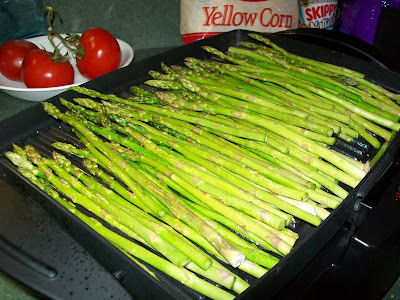 I was clearing off my camera and found this 'asparagus grilling' photo from when Charlie was away. Charlie doesn't like asparagus, so I cooked it for myself when he was on his baseball trip... It was AWESOME. A church sign down the street now says 'Five baptisms in Five Weeks' -they're on a roll! There's a small tobacco field not far from where we live. That's not unusual, but you see them less and less around here, like cotton fields. The funny thing about the tobacco field is that it is located in between a church property and the cemetery where Charlie and I have purchased plots! Have a nice Sunday, everyone! Tomorrow is Monday again! 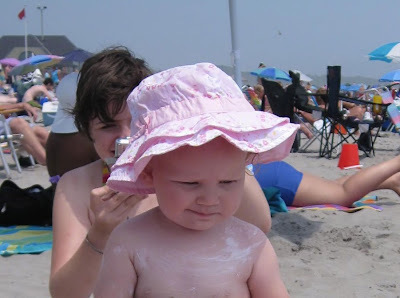 Here's a cute closeup of Savi with her umbrella-sized beach hat on, smothered with sunblock. Cute! I am leaving shortly for water aerobics, then meeting Charlie and family for lunch (after a stop at KFC) at his daughter and son-in-laws. Gotta go! It's cool this morning - 60 degrees. We've had lovely weather this summer, not as blazingly hot! Have a fun Saturday, whatever you do! I'm starting to lay out clothes for my BIG VACATION which starts this coming THURSDAY! Wahoo! It's Friday, and that means it's time to potty... I mean, party! This could be a booster seat, or could be a potty chair. Probably a booster seat. 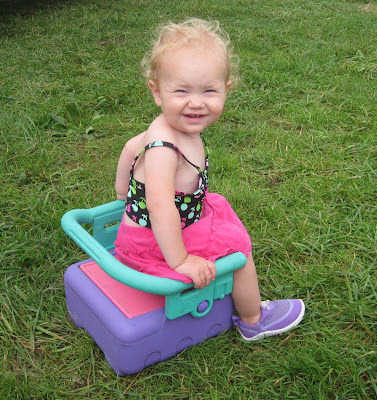 What a cute grin Savannah has, and check out her beach shoes! Awesome! There are new computer worms/viruses out there that download to your computer without detection. I have run across these TWICE in the last month - once at work, once at home, just by clicking on a normal looking, informational internet link after I've googled something. We have never had these issues before, so I know the viruses are getting smarter and able to infiltrate your system easier. They imitate a 'Security Alert' virus warning system. A message will tell you a virus has been detected by Windows, and ask you if you want to scan your system. Actually that message is part of the virus, and I have read that these types of viruses are called 'SmitFraud'. If you see a message about Windows detecting spyware infection that is not from your personal anti-virus software, or misspelled, do not run the check on your computer from your browser. Cancel anything asking you to run it, then open task manager, and cancel the process that is running it. Then use your virus checker, and spybot, adaware, whatever, to cleanup your system. It is also a good idea to save important files and pictures on CD or a backup thumb drive. So aside from that word of warning - have a nice Friday and a great weekend! Greetings, Bloggy Hunters and Fishers! Here's a quick story, then I'm outta here. Charlie, our crack, on location, blog photographer, took this photo yesterday, passing through a small town. 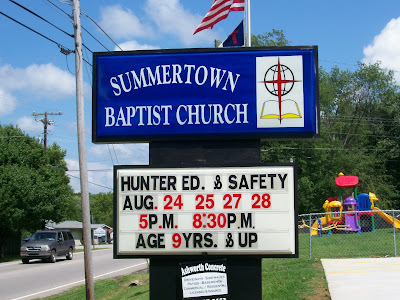 Instead of 'Vacation Bible School' or something to that effect, he thought it was funny to see a 'Hunters Ed' sign. Also note the advertisement underneath the church sign for a concrete company. Gotta go! Have a great Thursday and the weekend is almost here! 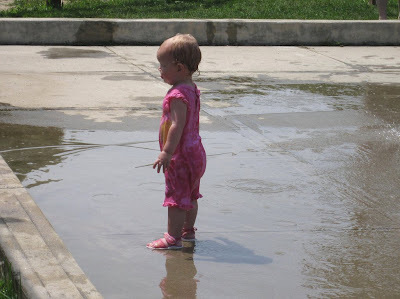 I don't know what she was thinking, but she had made up her mind! 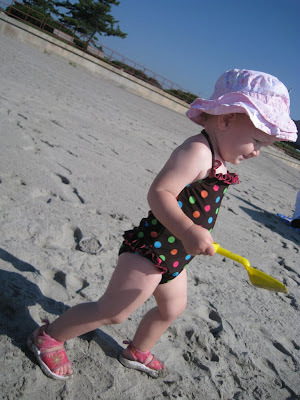 I love her polka dotted swim coverup, it is tres' adorable. My week is flying by, and I haven't worked on anything I expected to work on. One of the young and hunky lifeguard/water aerobics instructors taught last night. His name is George, and he's funny. He keeps all of us laughing through class. Evidently George didn't fit in with her exotic thoughts? Too funny! Gotta go! TTFN and have a nice Wednesday! 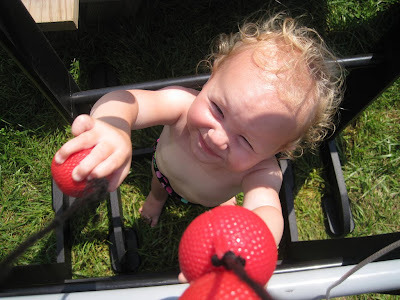 Savannah is 'helping' with the ladder ball bolos. What is ladder ball, you ask? Evidently a very popular yard game. I had never heard of it, so I had to find out about it online. Remember I mentioned I was having trouble pasting a link the other day? That's because Blogger wants you to use a special 'Link' button to set up your link. I found it this time. Hey - it's after 6 so I'd better go. 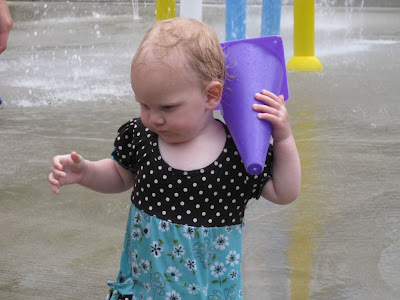 Here's a cute picture of Savannah playing NEXT to the kiddie pool - yes, she did go in and she liked it. Two little boys and their mom were having a great time, swimming. One of the Dads came in near the end of their swim. Charlie and I took a drive to Lynchburg yesterday and went to the 'Caboose Cafe' for lunch. We had delicious barbeque and walked around a little. Church sign of the day is 'Aspire to Inspire, before you Expire'. Ha! We had a fun afternoon and evening at the fish fry and ate way too much. Day 1273 - Birthdays and Anniversaries! Greetings, Bloggy Movers and Shakers! We moved to Columbia 7 years ago today. I never want to move again unless it's to an old folks home (or maybe a palace if I win the lottery). 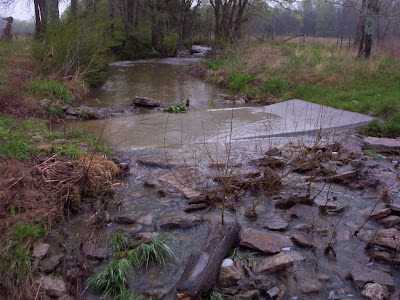 This photo from 2004 shows the creek on our property in spring (when there is water in it). It also shows the brand new, cement bridge (or low water ford) we had contracted to be built that year, so Charlie could drive a lawnmower or his truck back there. The bridge is still working perfectly! The reason I remember the date we moved is that it's also my father's birthday. Happy Birthday, Dad! I need to get ready for water aerobics, I think I'll stay for 2 classes. This afternoon we are going to a fish fry with Charlie's old fishing bunch. Nobody could consistently tell us what time to be there, so we'll go in the afternoon and see what happens! I'm making sausage balls to bring. TTFN and have a nice Saturday! Day 1272 - Friday, Hooray! 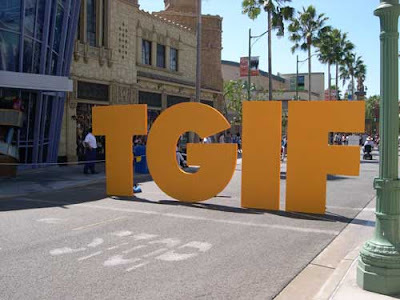 I can't believe it's Friday already - not that I'm complaining about it. I have my delicious, foame' latte' by my side that Charlie made for me this morning, the world is back to normal. I have two deadlines today, so I'd better have my head on straight this morning. Charlie has a doctors appointment (ah, the life of a retiree - hunting, fishing, and doctor visits) to go to, and I need to stop at the grocery store after work. Tomorrow we are going to a fish fry/cookout with Charlie's old fishing bunch. They would rent cabins and go fishing on Kentucky Lake twice a year, spring and fall. They are older now, and stopped going a couple of years ago. My favorite story about the fishing bunch getting older is this... Charlie said they used to get up at the crack of dawn, eat huge breakfasts at the lake, and spend all day fishing and drinking beer. As they got older, they got up later, ate less-greasy breakfasts, and they each grabbed a roll of Rolaids at the cash register instead of beer on their way to the boat. TTFN, have a nice Friday and a nice weekend! Day 1271 - Happy Birthday, Evan! Today is my son Evan's birthday - Happy Birthday, Evan! 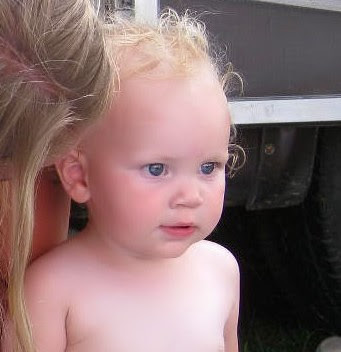 One of my favorite 'Evan' stories is when he was little, maybe 3. He was out on the porch where we could hear his conversation with Heather. He said 'Heather, do you think I'm handsome?'. Heather said, matter of factly - 'Yes, you're handsome'. Heather surveyed him critically. (We held our breaths in anticipation of what she would say). Heather said simply 'You have nice hair'. And Evan relaxed and said, satisfied 'Oh! That's where I'm handsome'. 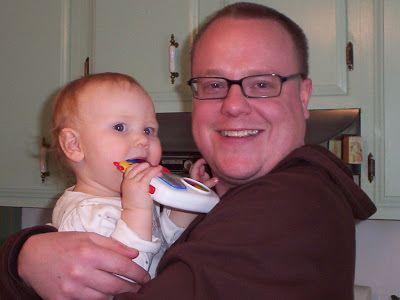 My story of Evan's birth was waking Evan's father up at 5am, needing to go to the hospital. He was irritated and said 'Are you SURE? ', as if my labor pains were a figment of my imagination. Yes, I was sure, and if memory serves, Evan was born at 9:20am. TTFN and have a nice August 13th and Birth-day! Miss Savannah has a little mohawk action going on in this picture. I spend my time trying to make my hair stay straight and not curl, but it looks adorable on her. Charlie returns from his whirlwind baseball trip, they drive back from Baltimore today. The guys had a great time, but I think they are ready to come home! Did I tell you that Charlie said he's ready to 'eat meals with a fork', meaning he's tired of hand-held ballpark style food and sandwiches and pub fare? I made a shrimp stir fry with eggrolls for supper last night so there will be leftovers in the fridge when he gets home. Guess I'd better take out the trash and get the newspaper FOR THE LAST TIME IN THE NEAR FUTURE! Hooray! TTFN and have a nice Wednesday! One more day till Evan's birthday! 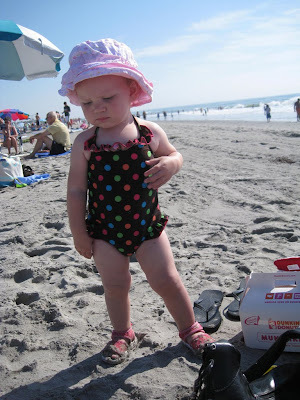 I think this photo is great - Savannah posing contemplatively at the beach... She looks a little tired too, but it is her 'casual stance' that I love about this picture. Also - note the Dunkin Munchkins box that made it into the picture. I agree with my mother, who likes the chocolate and jelly munchkins best, but I really like all of them; the coconut ones and the crunch ones and the glazed ones and even the plain ones. If you've never had one - you are missing some mini-donut heaven. Charlie called briefly from the Bronx last night, where the 'Baseball Tour Boys' attended an exciting Yankees game vs. Toronto. Toronto won, but my boy Jeter (yes, you can't deny he's a cutie) had a great game. He said it was as hot in New York as in Tennessee, and I saw an article that said Central Park reached 90 degrees yesterday for the first time this summer. Did I tell you we got our 'end of season' propane delivery recently? It may not feel like it - but fall is on the way! I also got a Christmas gift subscription magazine renewal notice in the mail. Good grief - Christmas is FOUR MONTHS AWAY! Guess I'd better enjoy these hot summer days, right? I liked the photo here because it shows our favorite munchkin reaching over a box of munchkins! If you're not a Dunkin Donuts fan, you wouldn't have even recognized a box of Dunkin Munchkins. I spotted them right away. What's a munchkin, you ask? Munchkins are little glazed donut holes, and they even fill some like tiny jelly donuts. YUM...and more YUM... A little bit of sugar heaven. Heather commented yesterday that it was freezing at the beach. I can't fathom it. Looking on www.weather.com at 8:30pm last night, it was 68 degrees in Providence, and 65 degrees in Maine. HERE it was 85 degrees with a heat index of 91. Hope it warms up a tad before my vacation! Have a nice Monday and TTFN! Must mean there are a lot of babies being born right now. Come to think of it - I have been to two baby showers recently at work, which proves my point. 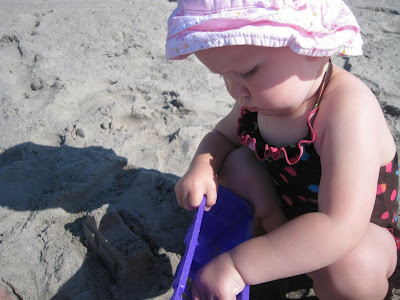 Speaking of babies - here is Miss Savannah, concentrating on her sand mold (or the sand inside the sand mold). The first time I wasn't home, I was taking advantage of our twice a year 'Tax free weekend' in Tennessee on clothing. Most New England states don't have a tax on clothes, but since TN Tax is around 10%, and coupled with the fact that I only looked at what was on clearance, I found a few bargains. He called again when all the 'ballgame' activities were done for the day - and said they had a great time in D.C.
Today they drive to Philly for cheesesteaks and a day game. I'm meeting Buddy Joe to see Harry Potter in 3D in the IMAX at Opry Mills. I didn't even realize they had a 3D show. Can't wait! Day 1266 - Ahhhh - Weekend! 'Shoulder' your burdens like Savannah here, and enjoy the weekend. Heather mentioned getting a long weekend. In Rhode Island, they still celebrate VJ day, so they'll have Monday off. Here, it's just another work day. Heather - can you tell yet if Savannah is right handed or left? I hadn't really thought about it. Charlie and TY and two more buddies left yesterday for a whirlwind baseball trip until Wednesday. TY does this every year, and Charlie is a fill-in for someone who couldn't make it this year. Today they are in Washington, D.C., hanging out with the president, touring D.C., and attending the Washington Nationals vs. Arizona Diamondbacks game. Fun, huh? Tomorrow they drive to Philly for some cheesesteak and another game. I'll fill you in on where they are each day. Gotta get ready for MY day, which includes exercise and meeting some girls from work at Cajun Steamer for lunch! TTFN! Enjoy your long weekend, Heather! I used to think it was very adult to have a taste of coffee or coffee ice cream when I was little. Well... you know what today is - FRIDAY! 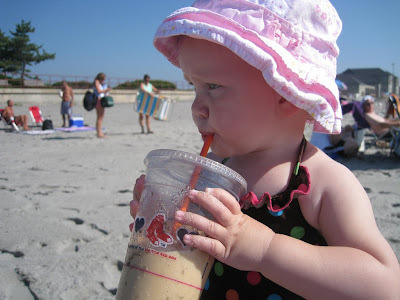 I don't know why these weeks go by so fast, but it is only 3 more weeks till my annual summer vacation in Maine and Rhode Island! Can't wait! Complaint: I was behind a car yesterday on the way home (for MILES and MILES) that was going 15 mph too slow. They would hit their brakes at EVERY intersection, and occasionally for no apparent reason in-between. I was SOOOOO thankful when they finally turned, but I was almost home by then. Gotta go! Have a nice day, and a great weekend! Day 1264 - It's Thursday - or Friday Eve if that sounds better! 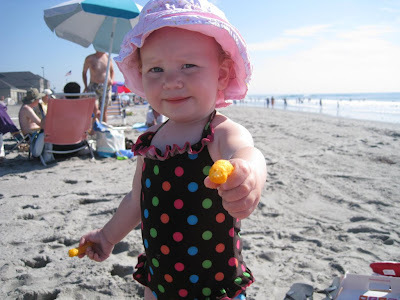 Here's Miss Savannah, sharing her delicious, sandy Cheetos with the blog! Thank you, Savi! Changing subjects to water aerobics - Charlie teases me about all the summer lifeguards they have at the health club. One of our favorites just went back to college and won't be teaching one of the classes anymore. 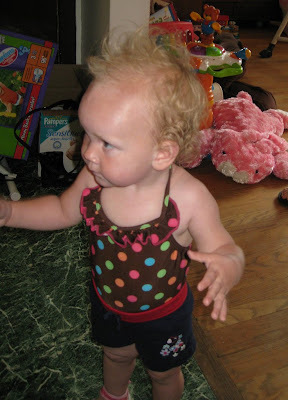 I love Savannah's 'water park outfit' - it is tie dye heaven. Her little feet are so cute in her matching sandals too. Heather - I am glad (now) that I was at home but poor until you kids started school. Most women I know have kids in daycare, and work, and somehow they manage! It's definitely a trade off - yes, you have more money - but no time except on the weekends. Changing subjects - a local home foundation repair company had a commercial on television this morning. That made me laugh... Gotta have lots of joke opportunities when you work at a 'crack repair' place. Have a nice Wednesday and TTFN! Day 1262 - Ready - set - gone! 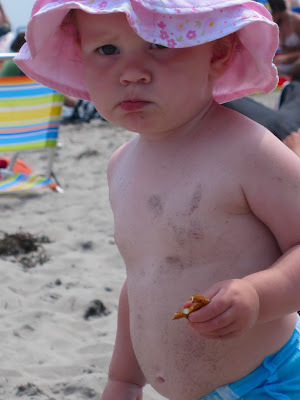 Look at her sweet little face - she loves the beach! I have to type and run this morning. I found out last night (after work) that I have a noon deadline on something I THOUGHT I had the rest of the week to work on. Gotta run! TTFN and have a nice Tuesday! Day 1261 - Now THAT's a FISH! 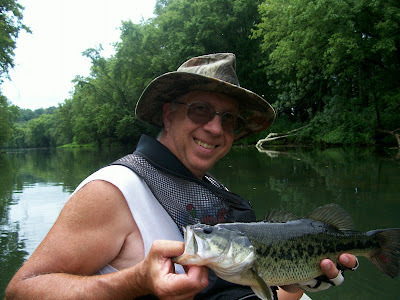 As you recall - Charlie and his son fished for catfish on the Chicamagua river in Chattanooga yesterday. 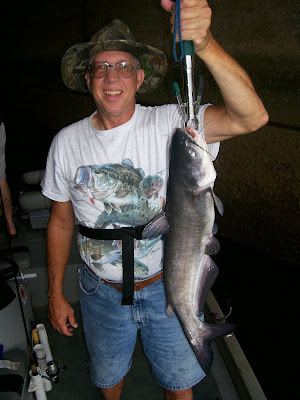 Here's a photo of Charlie with one of the big ol' catfish that he caught - what a fish! Some of them were between 10 and 15 pounds - too big to eat, but they brought home some of 'eating' size. They had a great day on the river, and the trip was a huge success. They returned home to dinner - seafood chowder (with catfish and shrimp) and cornbread. The cornbread had kernels of Amish corn in it, and chives. YUM-O! While the guys fished, I went to the health club, then to see 'The Proposal'. I really enjoyed it - it was a lot of fun and I really recommend it. It's better than 'The Ugly Truth'. Gotta go! Have a nice Monday and TTFN! Day 1260 - That's Bass-ackwards! Charlie and his son are in Chattanooga today, fishing for catfish. They are starting early in the morning, and I hope the weather cooperates. However, today's photo is a picture of Charlie and the large, spotted bass he caught - on his last TROUT fishing trip earlier this week. That's why today's blog is Bass-ackwards. I'll be going to the pool to swim this morning, and I MIGHT finally go see 'The Proposal'. Another bit of news - Heather likes one of the swim suits I sent her, which I am thrilled about. Now if my mother likes one of the suits I sent HER, I'll be batting 1000. Day 1259 - Happy Birthday, Steve! Happy Birthday to my brother in law, Steve! I haven't mailed his card yet - my apologies! I used to be great about getting cards in the mail on time - now I get them there EVENTUALLY. My son also has an August birthday, so I'd better get with the program. This is just a click and a promise, I've had a busy day so far and it's not over yet. TTFN and have a great Saturday!